Safeguard your Samoyed against bloat by learning the causes and warning signs. Most pet owners have heard cancer is a common killer of dogs -- in fact, an estimated 42 percent of dogs die of cancer. What you may not know, however, is that something as seemingly innocuous as air trapped in your pet's stomach can cause quick death. It's a condition known as bloat or gastric dilatation volvulus. The mortality rate for bloat is close to 50 percent, making awareness of this condition a necessity for dog owners. 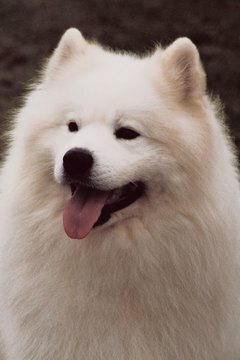 Samoyeds are among the breeds considered more at risk of bloat. Bloat has two phases. The first is the enlargement of the stomach (known as dilatation) due to gas and fluids. The second phase is the twisting of the stomach (known as "torsion" if the twisting is less than 180 degrees or "volvulus" if it is more). This twisting results in displacement and closure of both ends of the stomach, trapping contents and creating a potential life-threatening hazard as the stomach contents ferment and swell, ultimately interfering with your dog's blood circulation. Your pet is unable to relieve this pressure. The torsion or volvulus causes closure at the gastroesophageal junction, preventing oral relief (belching and vomiting); a similar closure at the pylorus prevents stomach contents from leaving via the intestine. The situation rapidly worsens, causing shock, septicemia, heart arrhythmias, stomach perforation, peritonitis and, if not treated in time, death. If your dog is suffering from bloat, the severity of the symptoms may not match the urgency of the condition -- so be aware what to watch for so you can take quick action if required. Panting, drooling, unproductive vomiting and the appearance of discomfort are indicators that something is wrong and your pet needs prompt help. Difficulty walking and an arched back may also present, depending on how rapidly the condition is progressing. Your dog's stomach may appear distended (but may not) and may be tender and tight and make a drumlike sound when tapped. If your Samoyed has any of these symptoms and you suspect bloat, see a veterinarian immediately. Don't wait to see if the symptoms pass on their own. A dog's anatomy and family history may predispose him to bloat, which is why deep-chested dogs with relatives that have experienced bloat are more at risk. Stomach tumors can trigger bloat, as well as can a narrowed pylorus, which is the connection between the stomach and small intestine. It can slow gastric emptying and increase the chance of air and gas becoming trapped in the stomach. Dogs with sensitive temperaments, such as those subject to stress and fear, are also more prone, likely due to excessive panting, which can draw air into the stomach. Eating food too quickly, as well as eating from an elevated bowl or an elevated surface, also creates risk. Bloat is not treatable at home; it requires urgent professional care. If stomach twisting has not yet occurred, your dog's vet will insert a plastic tube through the dog's mouth and into the stomach, resulting in a release of gastric contents through the tube. The stomach is then washed, and your dog is nourished by IV fluids for a day or two before oral feeding is reintroduced. If volvulus has occurred, your vet must perform emergency surgery to reposition the stomach and remove any necrotized tissue such as on the stomach or spleen. Nonsurgical treatment of bloat carries with it a 70 percent recurrence rate. Minimize this risk by taking steps to protect your Samoyed. If you feed him only once per day and he eagerly gobbles down his food, consider changing his meal routine to several small meals so he'll have less chance of stretching his stomach. Purchase a "bloat prevention" food dish, which contains raised plastic sections in the bowl basin that force the dog to slow down while eating. Alternatively, try placing a large rock or a tennis ball in your dog's dish to achieve the same effect. Never place food and water bowls on an elevated surface. Don't vigorously exercise your pet immediately before or after feeding him, and don't let him drink large amounts of water all at once. Avoid dry dog food that lists fat as one of the first four ingredients or that contains citric acid. Ask about stomach-tacking surgery, which some vets perform as part of treatment during an episode of bloat: The vet attaches the stomach to the rib cage so it cannot twist should the dog ever bloat again. Some pet owners have this surgery done as a preventative measure at the same time their dog is being spayed or neutered. Mirage Samoyeds: What's New About Bloat? WebMD Pets: Dogs and Life Span: Which Breeds Live Longest?